Cartwright Landscaping are experts at constructing new planting beds or refining existing beds for clients. 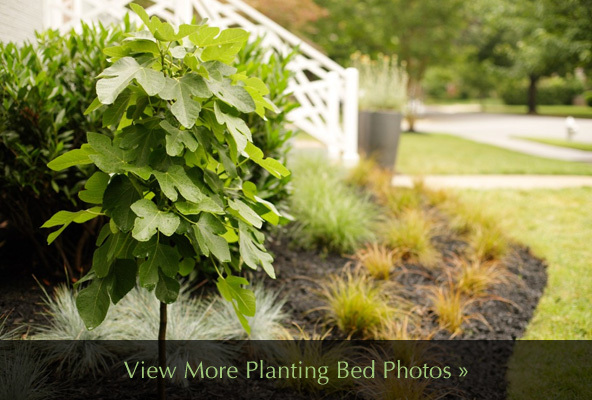 This includes clearing and preparing beds for plantings, and together with our clients, determining the shape of the new beds relative to current and planned future landscaping. 1 Using a long rope and spray paint, we’ll contour and mark where each new bed will meet the lawn. 2 With sharp, heavy duty edging shovels, we’ll create a clean, streamlined “hard edge” where the grass meets the planting beds, leaving a three-inch deep trench to act a catch basin, preventing mulch or pine straw from spilling onto your grass or hardscape and from interfering with line trimming upkeep. 3 Once the beds are formed, we’ll till the areas to loosen the soil. This promotes soil health by mixing up nutrients and allows new plantings to root easier. 4 During installation, we’ll amend the soil in your planting beds with a combination topsoil and organic, nutrient-rich compost to ensure the best possible soil for the long-term health of your investment.